It is a high quality cartoon. The morning in the city inspires melancholy. The city is cloudy and colorless. The dark grey sky illustrates feelings of loneliness and desolation. There is a young girl, sitting in a bench placed in a public place of the city. Unlike the depressive tones of the city, the girl and her suitcase are colorful. 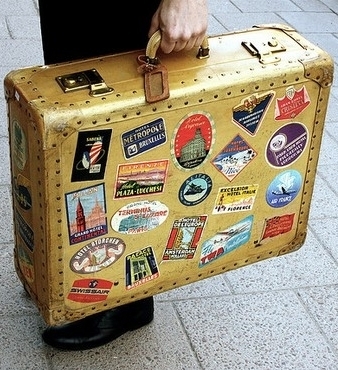 The suitcase has labels on it that indicate that she has traveled to different places. The purpose of this setting might be for the audience to focus specifically on the girl. She is wearing a green scarf, a long sleeve shirt, pink leggings, and brown boots. Her clothes suggest that the morning is cold. She is lying on the brown suitcase and some of her straight hair lays on her face. It looks like she is around thirteen years old. The girl is all by herself, there is no one around her but the desolate city. I wonder where her parents are. For a moment, she looks up to the sky like if she was begging for help. Her head is titled down, her back is not properly resting on the chair’s back, her eyebrows are slightly angled upwards, and her lip corners are turned down. Her body language indicates that she is going through an unfortunate situation, one that causes her sadness and distress. Even though the overall setting lacks from changes, the phrase “Brought to you by the U.S. Department of Health and Human services” appears at the bottom of the screen. Based on the message displayed, it seems that the video is somehow related to some type of situation in which someone is in need of receiving help from this entity or perhaps from regular people like us. Because the girl is the only character present in the scene, she might be the one having issues. She seems to be physically healthy, nothing visually indicates that she is physically suffering. Her body language might be a sign of emotional and psychological issues. This could be a situation in which the girl is broken on the inside. She has to be tired enough to keep the laces of her boots untied. Turning her body towards the suitcase, the girl holds it like if she is going somewhere. The fact that the girl wrinkles her forehead and closes her eyes demonstrates that she makes a great effort to lift her suitcase. At first, I thought that the suitcase was heavy for her to lift it. Then, I realized that my notion misled me. She is not leaving! Her angriness took her to throw the suitcase away to the filthy street. It seems that the suitcase is all she has, there is no place for her to go. That is why the atmosphere looks dull, because it acts as a mirror of the situation she’s going through. The purpose of the setting might be to illustrate that her life is like a city without inhibitors. It has always been about her without anyone to rely on. She is still sitting on the bench but this time she puts her arms around her right leg and inclines her head toward her right foot. She is clearly in desperate need of help. Suddenly, the shinny sun rises as a dark skin female and a white male come up from the suitcase. The girl’s facial expressions illustrate how surprised she is by the presence of the adults. Her eyes and her mouth are wide open in an expression of stunned surprise. It is impossible for her to hide her happiness, it seems that she is about to start a new stage in her life. Now, neither she nor the city represent sadness and depression. Everything is colorful now, you can see how the green plants and the blue sky completely vanishes the melancholic environment from the previous scenes. The appearance of all this colors might represent a transition in the girl’s life. The three of them hugged, which might be a symbolic way to communicate the audience that the adults came into the girl’s life to make it better. A huge heart appears on the entire screen for a few seconds. Then, it was transformed into an egg. This radical transformation might be a representation of home, where each family member loves and protects each other. The people in the scene are spending time together in a beautiful and clean kitchen. It is assumed that the adults that randomly appeared from the suitcase are the ones who own the house. In the background, the girl and the male have huge smiles on their faces. On the other hand, it is concluded that the woman is cooking breakfast because part of her arm can be seen on the screen. They look like a family spending time together and creating enjoyable memories. It seems that the video is focused on the idea of family because it avoids excluding any of them from the main picture. The girl is accompanied by the adults instead of being surrounded by a desolate city. There is fire and steam coming from the pan in which the eggs were cooking. Their facial expressions and reactions shows that they are scare of what is happening. The immediate reaction of the man was to protect the girl by pushing her away from the fire. Before, she had no one to look after her and suddenly she has people who care about her and have the will to protect her from anything that put her in danger. The camera angle changes to show the same three people in a trip surrounded by multiple trees and mountains. They are under multiple stars that embellish the dark sky. There is an enormous tent and, unexpectedly, a huge bear behind them. They look extremely afraid of the bear and their reaction is to hug each other. Is this a way to convey the message that union is important when facing obstacles? The purpose of showing two problematic scenes in a row might be to let the audience know that family stays together even when facing bad experiences. The girl’s suitcase seems to be her life companion because she takes it with her everywhere she goes. The camera moves to a completely different setting in which the girl is wearing pajamas and half of her body is covered by a blanket. The adults appear to be checking on her before she goes to bed. This gives the impression that they adopted her. It seems that the girl that was alone in the streets at the beginning of the video has her own bedroom now. She has more than a suitcase now, she has people who seem to love her and care about her. The girl is sleeping while the woman relies her right hand on her husband’s chest, this might indicate that they feel relieved for having the girl under their roof. The couple hugged and smile as an expression of happiness. All of the demonstrations of love between them indicate that their lives also changed. The three of them complement each other to create a lovely family. There is a cat sleeping in the girl’s suitcase. Literally, there is not a second in which the suitcase disappears from the video. As it was said before, the suitcase might be the girl’s life companion. It was everything she had until one day those amazing people came into her life to make her part of their family. A message appears on the screen: “You don’t have to be perfect to be a perfect parent.” Now, everything makes sense. The whole purpose of displaying scenes in which they were facing obstacles is to convince the audience that family is not about perfection, it is about affection. The entire video is designed to persuade people to adopt children who don’t have a home or anyone to rely on. Your vivid description of the first second of video is evocative and very effective, if slightly misleading in a couple of spots, Chemia. I thought she was sleeping from your description. You say she’s lying on the suitcase and that her eyes are closed. You say other things too, but those two details combined to lead me astray. You’ve missed an important detail that might be too archaic for you to have noticed. The “labels” on her suitcase are a cartoonist’s trope for “has done a lot of traveling,” left over from an era when luggage would collect pasted tags from its destination cities. After looking at the first second, I’m not watching the video, Chemia, so I need you to describe everything for my benefit. I admit I’m very confused how two adults come out of the suitcase. Do they climb out like clowns from a car at the circus? It’s a cartoon, so anything is possible. Therefore, your assistance here is crucial. Are these people the girl recognizes? Are they her own parents? Is this a reunion? I have little to say about the rest of your analysis. Still without watching the visuals, I have a clear idea of how the scenes look. I am surprised that SO MUCH happens in just a few seconds, but you’ve convinced me that it does. You do a lovely job of combining a visual analysis with your interpretations of the MEANING of the images, accomplishing both halves of your 1) Visual 2)Rhetoric assignment. I wonder if you have anything to say about the decision to use cartoon animation to deliver this message, though. It could easily have been done with actors. Why not? What problems did animation solve? What advantages does using art instead of live humans offer BESIDES problem-solving? Looking back over the entire spot now that you know the message, do you react to any of the visuals differently than the first time through? How does your understanding of the ad’s purpose alter your interpretation of the methods used to deliver it?